In this regular series, we're speaking to various players in the private equity and venture capital spaces—including startup founders, investors and noteworthy dealmakers—to see what daily life looks like for them. 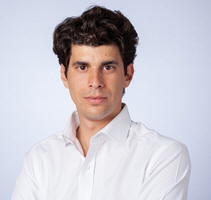 This week, we talked to Alexander Argyros (pictured), founder of investment technology platform Moonfare. A typical day starts around 7 am when I wake up and plan my day. I don't check my emails for the first 15 minutes. Also, before going to bed, I try to detach myself from technology. I go to the office around 8 am, where we have our daily meeting with the whole company. We spend 10 minutes updating each other on our priorities for the day and aligning on any team projects. Usually, I'm most productive in the mornings, so I try to carve out some thinking time then. After 2 pm, I'm usually in back-to-back meetings. Typically, all external meetings, such as partnership meetings, last until 7 pm. After that, I either continue to work until late with the team in the office or work from home. Sometimes, we also go out as a team for a drink afterwards. I come from a family of entrepreneurs. I always knew I had something entrepreneurial in me, but I never fully understood it until I started working for JP Morgan in investment banking. It was a great place to start my career but not where I saw myself in the longer term. I never envisioned myself as a managing director in investment banking. While I was at JP Morgan, I was recruited by KKR and that is where I learned to first think like an investor. I couldn't be more grateful for the experience, but again, I didn't see myself becoming a partner in private equity. When I put those two experiences together, I believe they prepared me well for a career in a fintech company, such as Moonfare. In addition, my entrepreneurial roots prepared me for being a founder. Most roles can be challenging if you push, and I always push myself. It's very important to constantly grow, learn and have access to the right sources of information. Constant learning is not easy. You need to find your mentors, talk to peers, read ... all that takes time. As we're building the business, the idea of learning is something I'm very focused on. It comes down to working with an amazing team. I started Moonfare with a vision of building an A+ team, so we were very careful early on to build a thoughtful and rigorous recruiting process. We review 300 people before recruiting for one role. Today, we have a team of over 40 people who are absolutely top performers, and that's the best part—forming a culture with them. It's about empowering and enabling. I'm learning to be a leader, and part of that is asking the right questions. It's tempting to be directive and to micromanage, but learning how to ask the right questions and lead a discussion is the most important part of my job today. What advice would you give to others in the industry? Compared to other industries, private equity is quite old-fashioned in terms of technology. Regulation is often seen as a hindrance to innovation. My advice is that there is always a better, faster and cheaper way to do things. That is what Moonfare is all about. We have built a platform to allow individual investors access to top-tier private equity funds in a better, faster and cheaper way. It sounds a bit pedantic, but we should always think outside the box, because there's still a lot of innovation out there that needs to be implemented. Quite a few, although they're decreasing exponentially as we build the business! I come from a very tight family, so I love spending time with my parents, my siblings and my extended family. This is something I cherish more and more. I'm from Greece, so I have a deep love for the sea and for fishing. It's something that I've practiced since I was very young. It's very easy to forget your real priorities. Often, I do. But, it's about constant balance. Having a balanced professional and personal life has long-term beneficial impacts. I carve out family time, and I cherish friendships that I have developed since my childhood. I try to compensate for not having much time for my personal life by organizing big dinners to bring everyone together at the same time. I would take a notebook and a pencil. It's hard to find time to be creative, and I try to take notes wherever I am. One of the books I read recently and loved was Richard Branson's autobiography, "Losing My Virginity," which talks about the way he started. Even through hard times, he built a fantastic business, and he always pushes himself. My favorite film, which I would take with me, is "The Shawshank Redemption." For an album, I would take something by Chromatics. They play very chilled music. For more of our "A day in the life" series, click here.